Exercises for the Office: Workout Tips to Stay Fit on the Job! 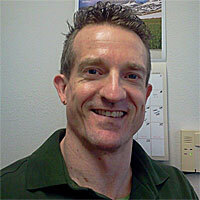 Home » Ask The Trainer Blog » Exercise » Exercises for the Office: Staying Fit on the Job! I know you’re not reading this on company time, but if you are, make sure to have that spreadsheet ready to maximize from your toolbar. And speaking of tools, this article will give you some tools you can implement to avoid many of the resultant health related issues that come with a desk job. With this in mind, start thinking of the potential for everything around your office to be used as exercise equipment rather than ergonomically designed office furniture and supplies. For example, your desk chair can double as an exercise bench, and those heavy three ring binders with the financials for last year, they make perfect dumbbells for shoulder laterals. 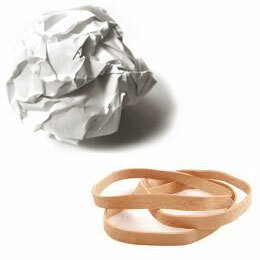 The drafts for next year’s budget you crumpled up and threw in the wastebasket, and the rubber bands on your desk caddy, those can be used to strengthen your grip. 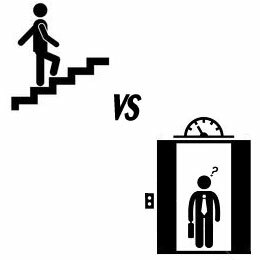 Probably one of the most significant and inconspicuous ways to get your exercise in at the office is to use the stairs when possible, and only use the elevator when you are transporting heavy items. I know, you’re probably saying, “No way, marketing is on the 10th floor, and I’m on the 3rd floor!” But there are 3 good reasons to take the stairs instead. 1.) Because you are sitting at your desk most of the day, this is the perfect opportunity to ensure your cardiovascular system remains healthy and efficient. And since cardiovascular disease is the number one cause of death in America, you can begin to take steps to avoid this mainly preventative illness by climbing stairs daily, which can help lower LDL “bad” cholesterol, lose weight, help relieve stress and lower the risk of hypertension. 2.) Daily stair climbing builds leg strength, which in turn can also lead to a better quality of life because it will allow you to be able to participate longer in more physical activities and remain healthier throughout your life. 3.) If the above two reasons weren’t already enough incentive to take the stairs, and you still think that taking the stairs isn’t worth your time, consider this: How many times have you stood in the elevator lobby waiting for an elevator to come and realized you could have already been to your floor if you took the stairs instead? Not to mention, when the elevator finally comes, there is usually a number of people already in it that inevitably require a stop at each floor along the way to yours! So now you’re stressed and missed an opportunity to improve your health. However, unless you are a power lifter, bodybuilder, or play sports regularly, you probably aren’t doing much to directly strengthen your grip. But don’t worry, even though you may be sitting at your desk most of the day, you can have everything you need to help strengthen your grip right within reach. Remember those wadded up and discarded drafts for next year’s budget mentioned at the beginning of this article? Reach over into your wastebasket and pull them out. You’ll only need about five sheets of paper to make a good grip exercise ball. Crumple each piece consecutively over the next as tight as you can until you can just get the tips of your fingers and thumb to touch over it. Now squeeze it as hard as you can for 20 repetitions or until you start to feel your hands and forearms burn. Switch the ball to your other hand and repeat for 3-4 sets with both hands. You can also use tennis balls or exercise hand grips as your grip gets stronger. You’ve now exercised the flexor muscles of your hands and forearms. Now it’s time to work the extensors of your hands and forearms. Reach into your desk caddy and pull out some rubber bands. The thick ones work best, but you can use a number of thin ones together as well. Pinch your fingertips together and place the rubber bands over the first joints of the fingers. Working against the resistance of the bands, extend your fingers out as far as you can, without letting the bands slide down your fingers, and hold it for a few seconds before returning to the beginning and repeat for 20 repetitions for 3-4 sets on both hands. Your forearms should be burning now and your hands may be shaking, but that is a good sign that you are beginning to strengthen your grip. 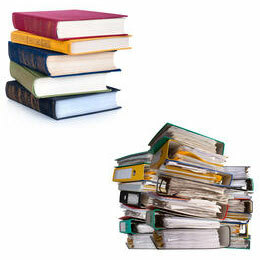 Odds are you have some nice thick office furniture and supply catalogs, and/or 3-ring binders stacked and shelved in your office. While these items may only weigh from between 3-10 pounds, they are perfect for exercises such as shoulder laterals and tricep kick-backs which allow you to get a nice burn with relatively light weight. This is a 3 part exercise in which you perform a bent- over lateral, side lateral, and then front shoulder raise. First, either standing in your cubical or sitting in your desk chair, lean forward at your waist until your chest is nearly parallel to the floor, and then extend your arms out to the side with arms slightly bent and palms facing the floor at the top of the lift. Hold the position at the top for a second and squeeze the muscles of the upper back and shoulders before slowly lowering your arms back down. Next, raise your torso up so you are standing or sitting straight up and then raise your arms out to the sides keeping the same slight bend at the elbows and palms facing the floor at the top of the arc. Hold the position at the top again for a second and then contract the muscles along the shoulder girdle before slowly lowering your arms back down. Finally, raise your arms straight out in front you till your hands are about eye-level and then hold it for a second before returning your arms to the side and bending over to repeat the sequence again for 3-4 sets of 10-15 reps. Admittedly, the above mentioned shoulder routine may get you some looks if you’re not behind a cubicle or office wall, so if you are in an open office setting you can do isometric exercises without being noticed. There are many different isometric exercises you can do right at your desk, so we will just look at one example and you can get creative and think of others. This example will strengthen your arms, shoulders, chest and back. Sit naturally at your desk and put both hands, palms up, under the table top. 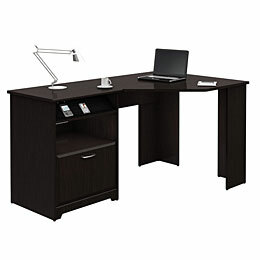 Now, lift up as hard as you can as if you were going to lift the entire desk off the floor. Hold this maximum contraction for 10-20 seconds while continuing to breathe normally; you don’t want to turn purple and have your coworkers think you are just severely constipated. Repeat this maximum contraction for 3-5 sets. You will also notice that these isometric contractions give you a great feeling of tension release after each set, and therefore can also be a good way to loosen up tight shoulder and back muscles. #5: Don’t Just Sit There! Finally, in addition to the above mentioned exercises, try to make it a habit not to remain seated for longer than 30 minutes at a time; get up and stretch your legs every 10 to 20 minutes. Go get some water or walk that report to marketing instead of putting it in the interdepartmental mail basket. In this first part of the three part “No Gym, No Problem” series, we have given you some fun ideas that you can easily incorporate into your busy schedule to ensure you don’t succumb to the health issues that can result from having a desk job. In part 2 of this series, we will continue with this same innovative mind set and give you ideas you can use to workout at home, and provide you with a challenging routine you can do on your stairs, if you have them. And in Part 3, we will cover exercises you can do at the park, which recently has really begun to pick up in popularity. So no matter where you are, working at the office, stuck at home, or at the park, we got your fitness program covered!